Hello friends! Summer. It’s so close you can feel it. The summer months captivate minds in a fantasy of lazy afternoons, warm weather nostalgia and spontaneous adventure - the perfect stage set to capture life’s most candid and memorable moments. From sunrise to sunset, each day offers endless opportunities for creativity. Our wish for each of you is to enjoy a beautiful season filled with your favorite things and most treasured people by your side. Lucky enough to take advantage of natural beauty year round is Nichole Burnett of Nichole Burnett Photography in Santa Rosa Beach, Fla. With a deep appreciation for Mother Nature’s surroundings, her soft pastel tones and hazy nature of images draw clients near and far to the scenic beaches and waters of the Panhandle. With talents that bridge both continents and cultures alike, we are elated to celebrate Hilary Camilleri, of One for the Wall Photography, as our 2013 Child Photographer of the Year! Her ability to surpass the surface and see straight to the heart of her clients through her lens gives her an artistic flavor unlike any other. Hilary offers subjects an in-depth look far beyond the glossy photo; she creates stories weaved by beautifully composed imagery. Her winning image, “Comfort in Love,” was displayed in the Big Apple’s Times Square for all to enjoy. For those interested in hearing from peers in the industry, we will be starting our NAPCP Interview Series again soon. Eager to see who’s in the hot seat? Discussing outsourcing and the idea of hiring sales consultants for your clients is Alice Park with Crystal James. You won’t want to miss out! 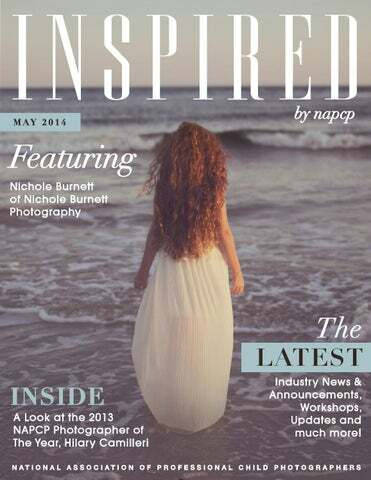 As we bid farewell to springtime, NAPCP encourages each of you to dive into the beauty of the unfamiliar. Whether that is scouting new locations, different subjects to shoot or even attempting a different style of photography, we challenge each of you to step outside of your comfort zone and explore those hidden talents. We know you have them. So get going – what are you waiting for? The National Association of Professional Child Photographers is thrilled to announce its 2013 Child Photographer of the Year, Hilary Camilleri of One For The Wall Photography! A winning image from Hilary was featured on an electronic billboard in New York City â&#x20AC;&#x2122;s famed Times Square. Burnett speaks the language of photography, and she does so with an unconventional, yet relatable style. As one of Santa Rosa Beach’s most highly sought-after photographers, Nichole is well-accustomed to the art of capturing more than just life in the moment. Read on to discover how she found her niche in the world of photo shoots and lenses at Nichole Burnett Photography, and see why she’s this month’s featured artist – believe us, it won’t take you long to figure it out. 1. Started photographing when? I've always been fascinated with photography, but I would say that I really started to experiment and learn in 2008. 7. Favorite framer? Myself! I like antique frames. The hunt is the best part for me. 8. Favorite age to photograph? I don't really have a favorite. Each age is inspiring and fun in different ways. 9. Favorite musician? It just depends on the day. Today it's Polica. 10. Favorite movie? 50 First Dates never gets old. 11. Recent favorite read? I just started Divergent. I'm always late to the party ;) 12. Favorite client product? I have several, but I just discovered Photobarn's wooden blocks. They are perfect for newborn sessions! 13. 3 things you can't live without? My family, laughter, and my camera. tions. I started offering mentorships for photographers as well, and I am so happy with where my business is going. We love how you incorporate the natural surroundings (desert, beach, etc) into your photographs. Can you tell us what kind of planning goes into these types of sessions? I am really lucky to live in such a gorgeous location. My surroundings have fueled my love to shoot wide so that I can capture the landscapes along with my subjects. Honestly, I'm not one to plan much for a session when it's in a beautiful location. I'll help with outfit choices if asked, but that's really it. I just let the day unfold naturally and capture the organic moments in my beautiful surroundings. What is one business lesson you wish you learned a long time ago? I wish I had learned that the "rules" of photography and business aren't one size fits all. If something doesn't feel right for you, don't do it. Take from ideas and turn them into something that fits you. I used to go into workshops taking every word as gold. Although my mentors had great advice, it wasn't until later in my career that I really was able to look at the bigger picture (with their advice in mind, and my knowledge from the mistakes that I had made) to build a plan that worked uniquely for me. Is there something that continually inspires you to be creative? So many things!! Things that inspire me would be: my clients, my children, pastel anything, water, music, sunlight, children's booksâ&#x20AC;Ś this list could go on and on. I carry a journal with me at all times so that I am able to jot down ideas when they hit me. Tell us about your typical work day and work week. From sunrise to sunset... One thing I love about being my own boss is that not everyday has to be the same. I wake up, get my kids ready for school, and let my husband take them to school. Once they leave I check emails, go over my to-do list, and start checking things off. Whether it's editing, blogging, or marketing research, as long as I complete my list I am free to do whatever I want. I can go to the beach, have a fancy lunch with my husband, clean, or take a nap. :) If I'm swamped with work I will work until it's time to pick my children up. Once my children are home, my work day is finished. Sprinkle in 1-2 sessions a week around sunset and that's what my work schedule looks like. Balance is always an evolving challenge. How do you balance work life and personal/family life? I learned a long time ago what I could manage personally and what I couldn't. I try my best to keep things simple and right for me. Balance is ever changing in our house. I have 4 children (and am expecting another this summer! ), so I'm sure I will have to reevaluate my schedule and refigure out this whole balance aspect soon. :) I know that I can't take more than 2 sessions a week and still be a good mom and wife. Knowing my boundaries and accepting them has helped me immensely. Another thing that helps me is that my husband works from home as well, so I have plenty of help with the children, etc. Things that I am not particularly strong in, I delegate out to others. I'm not super mom. I'm realistic mom. What are you most grateful for? I'm most grateful for all the support that I've been given throughout this process of growing a business. My husband, my mother, even my children without their support I would never be living this dream. Where do you see your life 5 years from now? In 5 years I would like to see myself in my dream house, with my beautiful children, doing much of the same that I am doing now. Life is good. To see more of Nichole's work, please visit her site here!